Every parish wants to provide parishioners with rich and inspiring catechesis in attractive formats during Lent and Easter Time. Now you can do so economically with the beautifully illustrated and versatile reproducibles on the resource's website and CD-ROM. 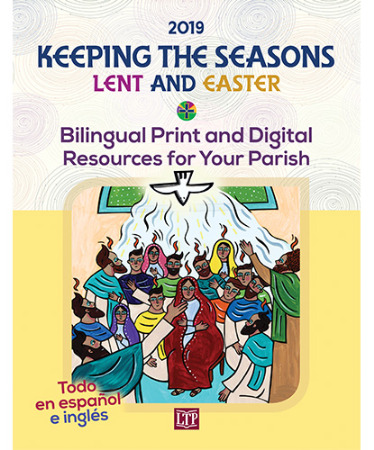 The core of the resource is the 19 handouts, in English and in Spanish, for Ash Wednesday and for each week of Lent and Easter Time. On the front of each handout is a prayer, illustration, and a reflection on the Sunday Scripture. On the back is catechesis for each weekday—about the day's Scripture, saint, or Catholic practices, along with a smaller illustration. Citations for Scripture readings are included with each day. The handouts may be printed in color or in black and white as PDF files. But even more helpful, the individual illustrations and sections of text are provided as separate JPG and Word files that may be reproduced as you wish—placed on your website, added to your parish bulletin, to worship aids, or to handouts of your own making. And in addition, you will find ready-to-print Lent/Easter Time cards and stationery for your annual greeting to parishioners as well as three posters in various sizes. A tutorial guides you through the many possibilities for using this remarkable collection of resources. Finally, you have permission to make as many reproductions as you wish for as long as you wish!